Travelling to the Alps, you will enjoy the lovely mountainscape, nice people and of course the lovely food. In this section of our MiaDeRoca-Magazine we will present you typical local recipies. Recipes for things to drink and things to eat, a wide variety of dishes with meat, with vegetabels and the so called "Mehlspeisen". "Mehlspeisen" are dishes with flour, sweet meals like the "Kaiserschmarrn", "Palatschinken" or "Topfenknödel". You won't be able to get all the traditional ingredients everywhere, but in cases the products are rare, we will mention some alternatives. And if you still doubt, just drop us a line, we will try to help you to get some Alpine savour to your lunch or dinner. Autumn is the time of pumpkin and squash, and it is time for hearty side dishes: barley. 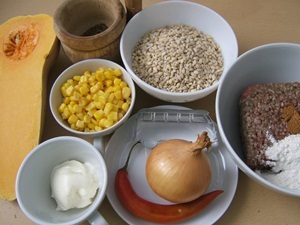 In Austria especially pearl barley is served and we will include it as tasteful side in our autumn recipe. 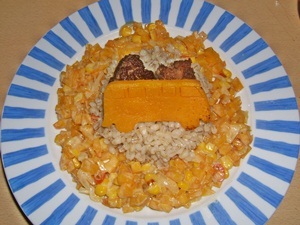 Our autumn dish has as a family dish, a special something to it – a pumpkin bus. The beginning of autumn that is usually the time for a last family getaway, if it is still dry, with the camping bus, otherwise we choose a more climatic independent holiday apartment. 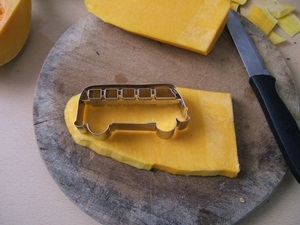 The pumpkin bus is a hint for a soon to come outing – and furthermore it should persuade those who are not so into veggies, to give squash a try. 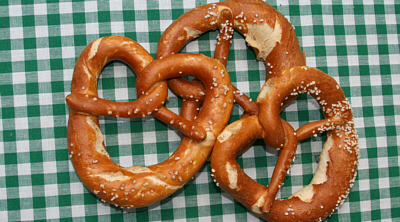 In Austria there is one typical way to serve minced meat: faschierte Laibchen. Besides minced meat you add dry bread cubes, egg, salt, pepper and marjoram – delicious. Especially amongst our younger family members, the crunchy meat balls of this recipe are the preferred way of having fried minced meat. The recipe of the meat balls is a variation of Spanish albondigas, without egg and without bread crumbs. If I like to serve something new to the beloved herd, maybe even something healthy, it is a good way to do it with these special meat balls, than it will get a big chance of acceptance. 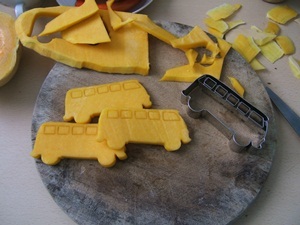 Carving pumpkin in a different way: cut buses out from slices of squash, delicious for small ones and big ones. If you soak pearl barley overnight its cooking time is 10 minutes. You still can use pearl barley if you don't plan ahead, it takes about 20-40 min if you start to cook it without soaking. Mix mined meta, flour, cinnamon and grounded caraway (or use whole caraway and use mortar and pestle to ground it a little), add some salt. Skin the pumpkin. For the squash buses you need slices which are 2-3mm (you might want to use a bread slicing machine as squash tends to be rather hard). Cut our the buses. Add the squash buses to the boiling pearl barley, after simmering for a few minutes you can fry them in some butter or sprinkle them with oil. Be aware that cooked squash gets much softer than the raw one (be tender when moving the buses). Cut onions and fry in a pan. Cut up all the rest of the squash into small cubes, when onion is nicely roasted and slightly caramelized add squash. Roast all for a several minutes , add cut chili and corn and use 2-3 table spoons of the barley cooking water to cook squash and veggies. Now used the spiced mince meat and form balls – those who like it extra crunchy can use some flour to form the balls, roast the meat balls. Before serving add nutmeg and coriander to the squash and vegetables, add some salt and stir in crème fraiche. If you like to you can sprinkle some balsamic vinegar onto your squash bus. The steamed and fried squash can be seasoned with balsamic vinegar. 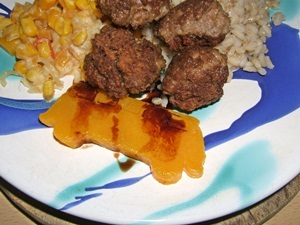 Our quick sweet and sour pepper sauce goes very well with these spicy meat balls, pearl barley and squash. This tasty and healthy dish can be served as part of your Halloween menu, we would recommend to cut the squash in the shape of bats (bat cookie cutter Ferdl) and red and yellow peppers cut out with witches' hat and witches' broom (witches' cookie cutter Walpurgis night). The squash and vegetables are yummy if you add some roasted peppers or you could use the peppers for pepper sauce (link to recipe see above). As starter to your Halloween dinner we recommend dragon soup and as snack you can serve crunchy bats Flapi.